A quality curtain track is like the secret ingredient in a cocktail, or the backing band for a popstar. You won’t necessarily pay it your full attention but you’d certainly notice if it wasn’t there (and not just because the curtains would be on the floor). The YewdaleVitesse® 6400W Curtain Track is a hand drawn track with a white aluminium profile designed to be used with large or heavy curtains. From a manufacturing point of view, this track is wonderfully simple and easy to build. From a customer’s perspective, this track is easy to use and strong enough to last for many years. One of the reasons for the 6400W’s popularity is due to the effortless way the roller runners transport the curtain. We find this curtain track is specified for a very broad range of environments, from domestic installations to schools and offices. This is because the track is considered to be a heavy-duty curtain track, yet is still slim enough to be discreet. The profile is slim but still capable of holding the weight of a heavy curtain. It can be hidden behind pelmets or alike and still perform as expected. The roller runners are the real star of the show, situated as 12 per linear metre and providing a secure hold on the curtain. The roller runners themselves are a supremely capable component, with two smooth running wheels located either side of the plastic eyelet. The wheels sit either side of the gap in the track, locked in. As a result, this track holds up well with heavy use and is robust enough to withstand the rigours of day to day use. It’s not only the end users who love the 6400W. There are just 12 key components that make up this curtain track, which makes it easy to build and to replace parts if the need arises. The track is made from aluminium, not plastic, which maintains strength and longevity. On the front of it, the 6400W looks like any other curtain track on the market, but underneath, hidden within the track, it is clear it is built to last taking whatever is thrown at it in its stride. 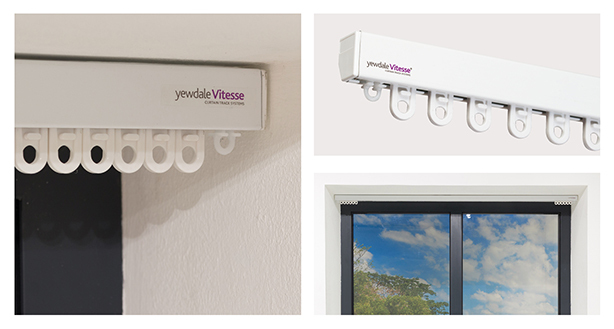 Take a look at the YewdaleVitesse® 6400W Curtain Track and please don’t hesitate to get in touch if you have any questions.